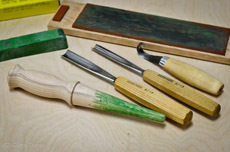 I continually try to improve my processes and methods to become a more skilled woodworker. But in one area, I have allowed myself to go unchallenged and haven’t made improvements: maintaining a super-sharp edge on my curved carving tools. I finally had enough and decided I would turn a stropping slip with a handle.